It’s a Music Festival, at a Train Station. All Aboard!!! Posted May 25, 2013 by Kellen Coffis & filed under Uncategorized. Its getting hotter by the day up here in the forest of Ben Lomond CA which means June is right around the corner. Cool thing about June is we’re playing a bunch of shows! The first of which we’re pretty pumped about. 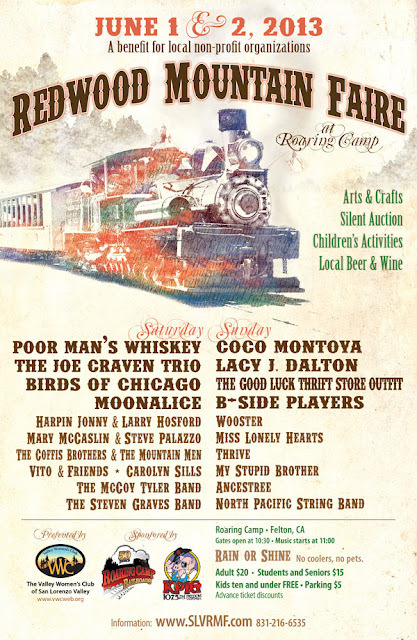 Our hometown festival, The Redwood Mountain Faire is June 1st and 2nd at Roaring Camp in Felton CA. We will be playing on Saturday June 1st at 12, high noon, on the Meadow Stage. Also make sure to check out our drummer Henry Chadwick’s band, My Stupid Brother, on Sunday on the Creekside stage at 1:00. Word on the street is they could be joined by some additional stupid brothers, (Hint; Kellen and Jamie), as well as Mountain Man and bass player Mason Hutchinson. It’s going to be a great weekend, nay, a great summer! Check out our upcoming shows, we just added a number of them. Petaluma! Sacramento! San Francisco! Oregon! Utah! Wyoming! Holy smokes we’re crossing off states left and right, see you out there.